"It looks like home cooking. It tastes like home cooking. Because it's just like home cooking." It's called "cookwashing" - where the food industry has hoodwinked us into believing that mixing and stirring packets together constitutes "home cooking". 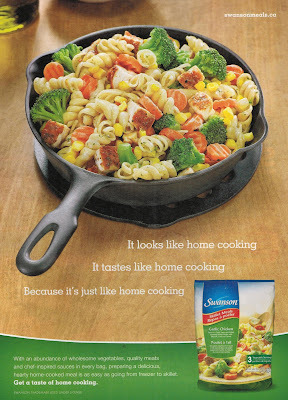 So is Swanson's Garlic Chicken Skillet really like home cooking? "Vegetables: Broccoli, Carrots, Corn. Pasta With Garlic Sauce: Cooked Enriched Pasta, Vegetable Oil (Soy And Coconut Oils And/Or Hydrogenated Soybean Oils), Sweet Cream Powder (Cream, Skim Milk, Soy Lecithin), Skim Milk, Salt, Seasoning (Garlic Powder, Enriched Flour, Parsley, Sugar, Hydrolyzed Milk Protein, Autolyzed Yeast Extract, Natural And Artificial Flavour, Spice), Natural Flavour. Grilled Diced Chicken Breast Coated With Seasoning: Chicken, Water, Isolated Soy Protein, Seasoning (Sugar, Garlic, Dehydrated Romano Cheese (Milk, Bacterial Cultures, Salt, Enzymes), Dehydrated Onion), Salt, Sodium Phosphates, Natural Flavour. Coating: Corn Flour, Wheat Flour, Salt, Corn Starch, Spices, Paprika, Maltodextrin, Caramel Colour, Defatted Soy Flour, Sodium Alginate, Baking Powder, Extractives Of Paprika. Contains: Milk, Soy, Wheat." While I've certainly come across far worse processed meals than this one, home cooking it's definitely not, while the suggestion that it is, that's simultaneously the food industry's most seductive and destructive lie.